We make it easy for you to get a better deal for your business phone line, comparing prices from a panel of trusted providers and setting up any contracts to save you time and money. A dedicated business phone line (or landline) can be essential to helping your business run smoothly. Not only can you take advantage of the cheaper prices offered for businesses, but a business phone line often includes a range of optional extras that can make it easier to handle your business's communications. You might also save money by opting for a bundle that includes business broadband, business mobile and Voice over Internet Protocol (VoIP) services within the same deal. In order to find the most suitable business landline deal for your business, you’ll need to consider the individual features offered with each deal and how this compliments your business activities. As each business has different needs, it can be difficult to determine a universal ‘best deal’ when it comes to business phone lines. 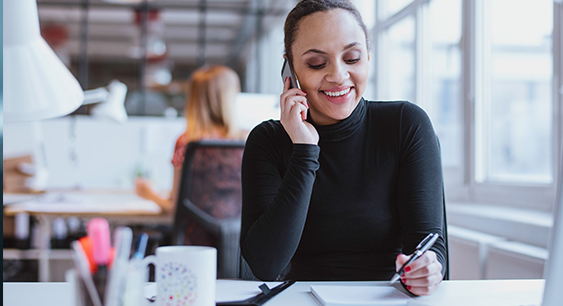 Instead, the following is a short guide to the common features and extras offered with a business landline deal, and how they can benefit your business. This should help you figure out what to look for when comparing deals. The first thing you’ll need to consider is the type of phone line your business might require. There are several different types of phone line available, each offering specific features. You’ll need to consider your business’s current and future needs to find the most appropriate type of phone line to purchase. These are single phone lines that provide basic features. They allow phone calls to be made and received, allow connection to the fax machine and are used for receiving broadband. This might be suitable for small businesses without a high volume of customers or clients. If you regularly need to speak to more than one customer or client at a time, a PSTN analogue multiline system may be more suitable. This involves extra (or auxiliary) phone lines that are linked together through a telephone system known as a switchboard. Switchboards are usually available in the form of a private branch exchange (PBX) system or a private automatic branch exchange (PABX) system. When you receive a call, the switchboard can route this call to any line within the group that is free. ISDN2 and ISDN2e lines are best suited for businesses that regularly make between two and eight connections to the phone line at the same time. An ISDN2 or ISDN2e line is called a channel or a circuit and should be able to produce a high quality digital connection. Each ISDN2 or ISDN2e line includes a pair of channels which allow voice, video, faxing or broadband. As one ISDN2e line has two channels, you are able to make two calls simultaneously. You can add additional circuits if you need to access more connections at the same time (two lines = four connections, three lines = six connections and so on). An ISDN2e line also allows you to allocate separate phone numbers for each use – for example a separate telephone number and a separate fax number. If you’re a larger business, you might benefit from an ISDN30 line which has similar features to an ISDN2 or ISDN2e line but can support between eight and 30 channels at the same time. Installing ISDN30 lines at your business will require a site survey, and installation can be more difficult - and subsequently more expensive - for rural areas. If it is found that it is not possible to install ISDN30 at your premises, you will need to install ISDN2e. Having determined the type of phone line most suitable for your business, the next thing you’ll need to consider is the type of business landline deal offered by the various providers. Business landline providers usually combine a range of features and extras which they price at different levels in order to create specific call plans or packages aimed towards different business models. You’ll need to consider your current phone usage habits in order to determine which packages are most relevant for your business. Line rental: this is the biggest charge and is the price you pay on a monthly basis for having a phone line at your premises. Low-cost number for your business: customers are more likely to call a business if their number is free to call (0800, 0808, and 05xx), low-cost (0845) or local. You may be provided this number free of charge. Premium-rate number for your business: you might consider a premium rate number in order to receive an income from your customers’ calls. Again, this number may be provided free of charge. International calls: price often varies by destination. Calls during peak hours are often charged at higher rate than off-peak calls. Direct Dial In (DDI) numbers: these are separate phone numbers for devices connected to an ISDN2e or ISDN30 system. Contract length between twelve and twenty four months. Capped call charges: ensures you never spend more than a certain amount on calls. No charge up to an hour: allows you to make free calls up to an hour of talk time, after which you’ll need to pay by the minute. You can hang up and call the number again to restart your free allowance. Call divert: allows you to divert calls from your business phone line to a mobile or other number. Call waiting: allows your phone to send you a beep to alert you that another caller is trying to call. Caller ID display: allows you to view the caller’s number before you answer so you know who it is. Call back: if a line is engaged when you make a call, you’ll be automatically called back once it is unengaged. Call barring: allows you to block certain types of outgoing calls such as those that might cost you money. Anonymous caller reject: allows you to block calls from withheld numbers which can help minimise nuisance callers. Ability to withhold your own number. It is important to compare deals from various providers in order to help you find the best deal possible. Of course, alongside the particular features offered with a business phone line deal, you’ll need to consider your provider’s customer service reputation, as well as the level of support and assistance they are able to offer you if you experience a problem with your phone line.